One of the selling points of the reigning king of phablets, the Samsung Galaxy Note 2, is its generous screen size. At over 5 inches, it’s got a half an inch improvement over its predecessor and it gives a lot of people more screen real estate than what other top-of-the-line smartphones, such as the iPhone 5 or Samsung’s own Galaxy SIII, are willing to give to users. Surprisingly though, if the comments we’ve seen are to be believed, people are still not satisfied with the Galaxy Note 2’s 5.5 inches and are looking forward to smartphones that are perhaps pushing the definition of “handy” by having a screen in the 6-inch range and beyond. If you’re one of those people, then you may want to check out the Kingcom Padphone 61. Sure, the specs aren’t anything to write home about but what about its less than $300 price tag? According to the report, the phone sells at a contract free price of Php11,318.00. That’s about $278, based on today’s exchange rates, and about half of what you’d have to shell out for a Galaxy Note 2. 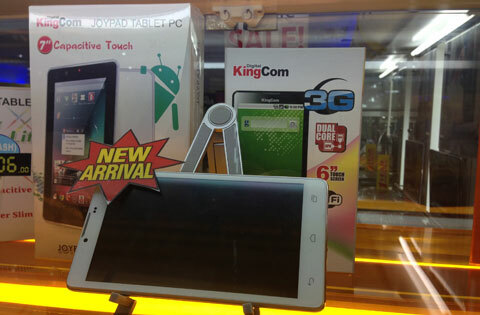 Is the Kingcom Padphone 61 worth a closer look? Would this be a viable alternative to the more expensive Galaxy Note 2? Share your thoughts in the comments below!